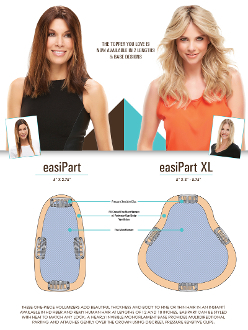 Easipart HD XL by Easihair - 12"
Our Products >> Easipart HD XL by Easihair - 12"
This one-piece volumizer adds instant thickness with naturally stunning Remy human hair. It clips in quickly and easily for all-day comfort and can be styled with heat to create any look. Available in lengths of 12 and 18 inches with options for both beginning and beginning-mid stages of hair loss. Base Dimension - 5" X 3-5.75"
-In original, factory condition (unaltered, unworn, undamaged, and with tags attached) and in original packaging. -Item(s) must be returned within 14 days of receiving your original order. -If you would like an exchange we are happy to do so for you, simply contact us for return instructions. We ask that you pay shipping on your replacement piece ($20). We will ship your replacement as soon as we receive your return. If you would prefer to return your hairpiece or wig for a refund, a 25% restocking fee applies. If you are unsure of what size wig you need, please measure your head and refer to our handy wig sizing guide, or if you are in the area stop by at our shop for a complimentary sizing.